It’s time to get those Holiday Cards printed! Pretty gold foil details are everywhere, and I love that little bit of shine! The shimmer of a foil-stamped card is perfect for the holidays. I knew I wanted my family’s cards to be foil-stamped, but I didn’t want it to feel like an afterthought – I wanted to design an entire stationary suite designed around that shiny greeting. That meant I needed to find the perfect details and backgrounds to compliment the gold foil and make it pop! 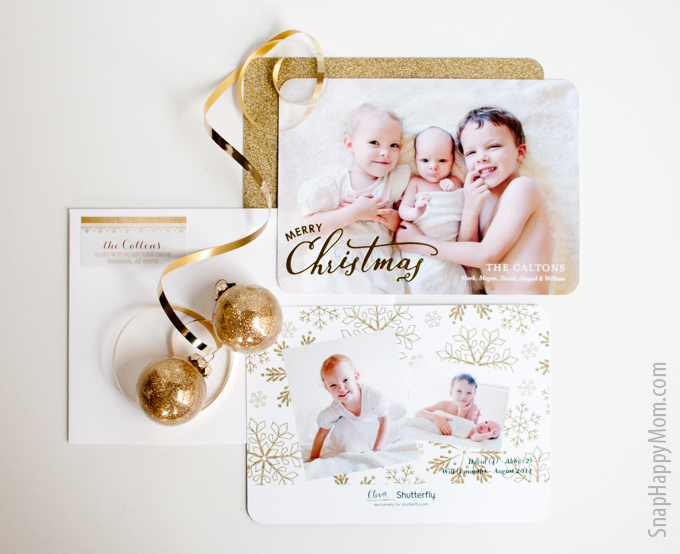 I’m thrilled to work with Shutterfly this year on my holiday cards: their Perfectly Personal™ Holiday Cards are exactly what I was looking for! There are tons of beautiful gold-foil designs to choose from, with backgrounds that compliment the shiny foil and coordinate with the festive them. 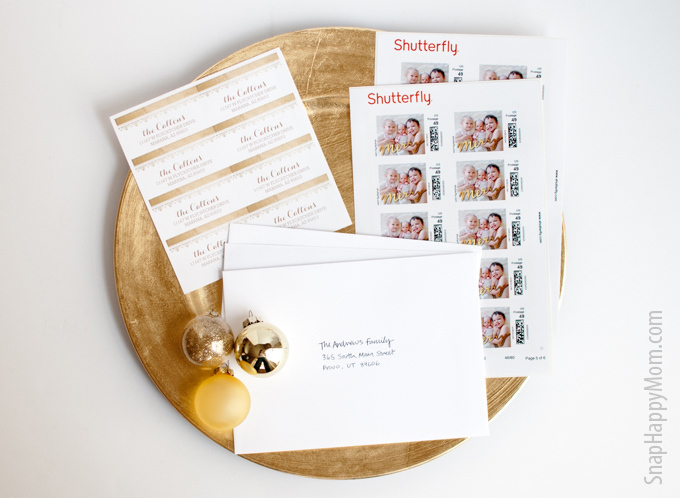 Whether you like the gold glitter look or the bright gold shimmer look, Shutterfly has gorgeous options for your cards, address labels, and invitations. If you want to send foil-stamped cards this year, check out the Perfectly Personal™ options from Shutterfly. I picked one gold-foil design that says Merry Christmas for the front of all my cards. I couldn’t decide if I wanted the glitter or the shimmer design for the back… so I ordered both! I wanted to pick just the right shimmery details to go with the gold foil on my front design, so I went with the backgrounds that imitate gold shimmer color and stripes. 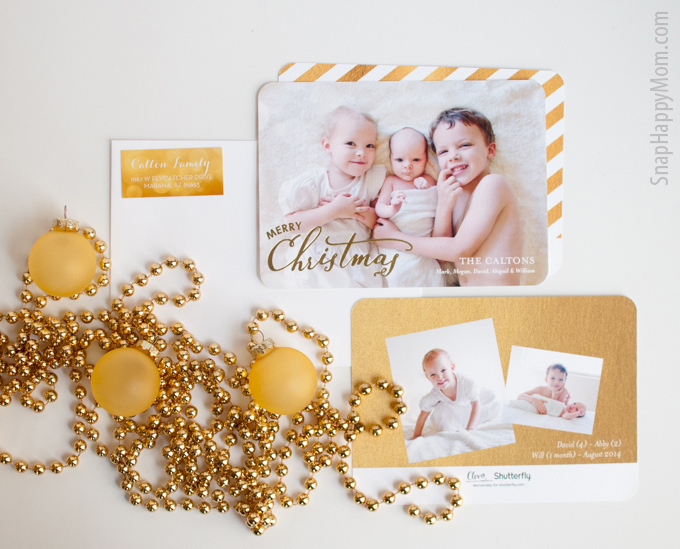 The bright gold is so festive and fun, and there are perfect shimmer address labels to match! If you love the gold glitter look…. The same foil-stamped design can look totally different when you pair it with gold glitter. There are two options for the back of the card that feature the glitter look without the mess! I love the delicate glittery snowflakes, as well as the background that looked like solid glitter. Add in some pretty address labels and classy rounded corners for a perfect stationary suite. I’m a big fan of anything that makes the card sending process easier. Personalized postage to save me a trip to the dreaded post office? I’m in! Pre-printed address labels? Yes please! I love that Shutterfly has cute address labels that match my cards perfectly. Oh What Fun! 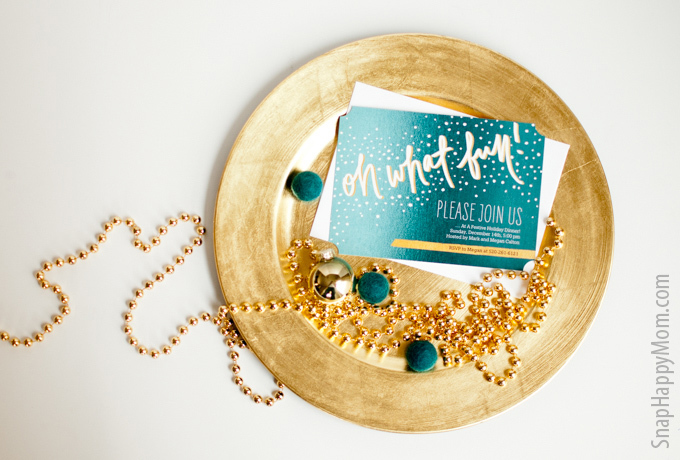 Aren’t these gold-look invitations lovely? Shutterfly has party invitation too, in all different styles. I’m obviously into gold this year, and I loved this one with teal and a bit of gold shimmer. Now who’s in for dinner at my house? Add your children’s ages with their names. I can’t tell you how many comments I get about it, every year! People really appreciate that little detail, especially the family and friends that live far away and aren’t as involved in our everyday lives. Which version do you like better- the gold glitter or the gold shimmer? I love them both! This post is sponsored by Shutterfly and I received compensation in exchange for this post; however, all opinions and styling are my own. I love picking out Christmas cards– and I hadn’t thought of gold ones, but NOW I WANT THEM! I spend a lot of time and effort choosing EXACTLY thee perfect ones. These are them! Those Christmas cards are gorgeous & you are so on top of it! I just decided not to send out cards at all this year. I need to live by you so you can take my family pictures. I love the idea about the names and ages- that’s awesome! I penpal as well and have a lot of people who’ve never met me but I talk about my family all the time. That’s a perfect way to put faces to names, with certainty and without having to doodle on things myself. I love the touch of gold. These are so cute. I love that they are personalized. Those are so pretty! I have not done Christmas cards in a long time and I think that tradition should not be lost! Thank you for reminding me I need to do this again! So pretty! I need to order Christmas cards and cards for my cookie exchange!!! I love how the gold looks! It’s just about time to pick my cards out too:). That shine is gorgeous! We are getting picks taken and hope they work with these cards! Beautiful! Shutterfly has some gorgeous gold foil options, with tons of different designs. I’m sure something will work! I have been LOVING gold foil this year. Thank you for sharing these cards. So stunning! Loving the gold foil everywhere this year! I am definitely a shimmer over glitter person! 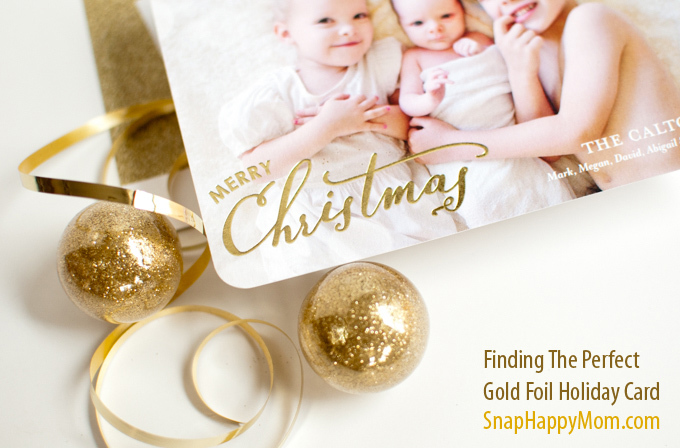 I am going to check these out – I have been on the hunt for gold foil holiday cards! Gorgeous cards.. never thought of using gold before. I love the gold foil look too. Your cards are adorable! I know the feeling- we send out a lot as well. Shutterfly usually has great coupon codes though! I love the gold shimmer. I haven’t bought my Christmas cards yet, but these looks so festive! I love the gold shimmer look – that is exactly what I’m looking for this year – thanks for sharing! These are so pretty! They’ve also reminded me that I absolutely need to take our family picture this weekend or we won’t have anything to send out on our cards this year!! Don’t forget to take that picture! Are you taking it yourself? I totally want to see it! Personally, I like the gold shimmer look better. These are beautiful looking though – sending out classy looking cards is DEFINITELY up there with one of the “as soon as we’re grown up” things we’ll start doing. I know! I didn’t do it until we had kids, and it felt very “grown up” to actually have a reason to send cards. The gold is so pretty! I don’t do any holiday cards but I love the examples. These are beautiful! I’m totally falling in love with gold foil everything for the holidays. I love cards like this and gold is my favourite at this time of year. I’ve convinced my boyfriend that we’re going to start doing photos like this even when we get our first dog! Do it! Dogs can be part of the family! Wow, the gold foil looks so pretty! It’s everywhere this year and I’m loving it! I love the gold and teal. I don’t usually care for too much gold but that looks fantastic. I know, I really loved that deep teal- it’s a lovely shade, and looks like it shimmers without actually shimmering and being hard to read. Oh my gosh these are beautiful!! I absolutely must order these! These are super cute. We usually pick up boxes of card at the dollar store since we have a LOT of people to send cards to each year. We have a lot to send as well- Shutterfly has great coupons though! Gold is such a gorgeous color for xmas cards. This post reminds that I have to get on my cards ASAP. Oh boy! I LOVE picking out our Christmas Card every year! 🙂 Shutterfly has some great options! Gold and foil are definitely “in” this season! 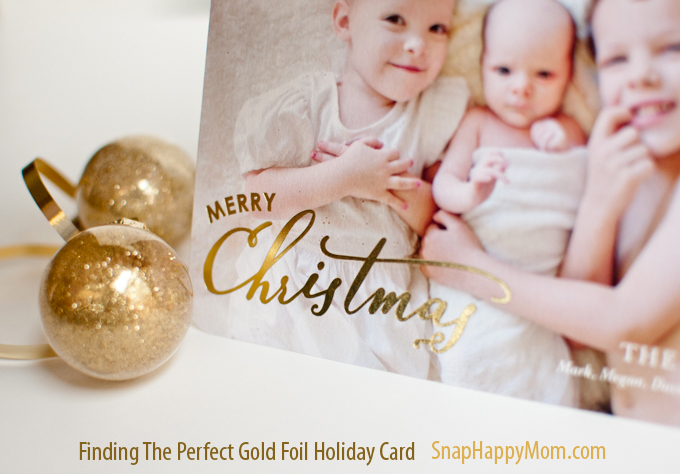 Love gold foil in Christmas cards! I want to design some of my own and it would be great to find a printer that can print them, as I haven’t really bothered to source one yet. The idea is to do Christmas family shoots and design custom cards to go along with them, then leave the printing up to the client. Such beautiful cards, and such cute little kiddos!!! Love the gold foil design.